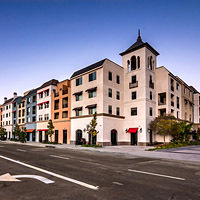 Developed by Thomas Safran & Associates in 2013, The Renaissance at City Center is a 150-unit, four-story European style community with state-of-the-art amenities and ground level retail stores. The property was sold to new owners in 2016 and is no longer under Thomas Safran & Associates management. The property boasts one, two, and three bedroom spacious and luxurious apartment homes. Each residence offers a beautiful gourmet kitchen featuring energy-efficient, stainless-steel appliances and granite countertops. In-home details include a washer and dryer, walk-in closets, designer-inspired bathrooms with deep, soaking tubs, eco-friendly, dark wood laminate and plush carpeting, and private patios/balconies. **Please note this property is not an affordable housing property.